By the time they were adults, my children had attended many more weddings and funerals than their peers, which we as parents thought was a really good thing. So I was greatly encouraged this week to see a post on the Gospel Coalition website extolling the benefits of taking children to funerals. Our instincts are to protect our children from upsetting experiences and often that is the right thing to do if those things are harmful, or the child does not have the maturity to cope. But in the case of funerals, if done sensitively, they can be fruitful learning opportunities and help them to grasp gospel realities. A funeral will show children that Christians grieve – yes, with hope, but often with tears. I remember hearing my dad crying in his bedroom when my grandfather died, probably the only time I had ever known him to weep. I was upset too, and it helped me realise that it was OK to be so. 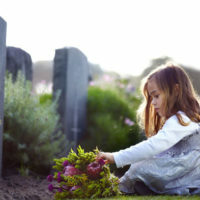 A funeral will model to children how to grieve and how to empathise with those closely involved. For many families the first funeral a child attends will be that of a close relative which is a big emotional and social challenge. They have no idea what to expect, how to behave or how do deal with their feelings. However, in a church family there will often be funerals of people we know and love but who are not such close family members and it may enable our children to learn some of these things in a less intense environment. Attending funerals will also help our children understand that suffering and death are part of life in this fallen world. What better way to convince them of their need for Christ to give new life? Participating in a funeral will also help our children see gospel truths in stark contrast to the hopelessness of death without God. At Christian funerals, the gospel is preached and life and mortality are seen in the light of the victory of Christ over death. As well as the preaching, prayers and songs there will often be a eulogy and, in the case of a Christian, our kids may hear testimonies of someone whose life was devoted to Christ through years of work, family life, service in the church and suffering. It will ground the gospel in the realities of life and inspire them to live for Jesus. So although I do not expect you to rejoice at the next funeral invitation, I would strongly encourage parents to take their children with them so that they can be part of the family grieving “in hope”.